Guilin is famed with remarkable landscape and authentic minority culture. 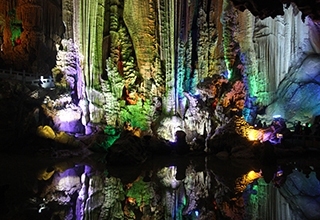 See the best of Guilin’s krast landscape and river scenes by visiting the iconic Reed Flute Cave and taking a Li River cruise. 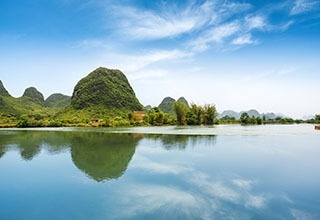 The well-known Yangshuo County is a mellow town surrounded by rice paddies, moon-shaped hills, lush green landscapes, and rural country life mixed with exotic atmosphere. It is an ideal holiday getaways. Longsheng is dramatically different with Longji (Dragon&apos;s Backbone) Rice Terraces and quaint Zhuang and Yao minority village. 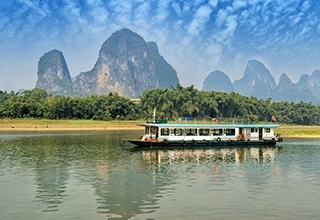 Enjoy the Guilin city highlights and admire the dream-like views on Li River during a cruise. Soak up the culture and scenery of Guilin and Yangshuo in the most popular way. Relax yourself by the views in Guilin city and during a Li River cruise. 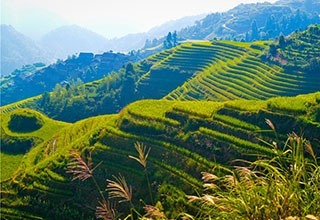 The Hiking on the Longji Terrace Field and cycling in Yangshuo Countryside make your trip more interesting. Get to deeper parts in Guilin and Yangshuo by hiking and cycling to see even more fantastic views where are not knwon by too many tourists. Join in us if you want to challenge yourself. A cruise from Guilin to Yangshuo and transfers between your hotel and port and bus transfer from Yangshuo to Guilin. Save your money. Comfortable car, insightful tour guide and most-visited attractions, we help you enjoy and understand the highlights in Guilin city within 5 hours. 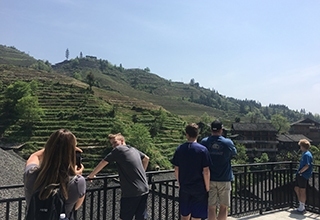 Hike on the unique Longji Terraced Field to learn Zhuang People’s culture and admire the mountain views. Private transfer makes you more energetic. 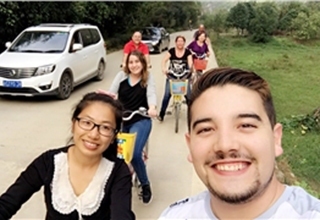 Cycling along the Yulong River, the most beautiful part in Yangshuo, you will forget all the unhappy and enjoy the natural beauty to the fullest. When is the best time to travel to Guilin? March to November. The climate is mild during the 9 months. Where to buy Li River Cruise Ticket? No, you can also take a bus or hike along a section Li River from Guilin to Yangshuo. The bus station is in the center of Guilin city, near the Guilin Station (train station). If you want a hiking tour, please feel free to contact us. Will hiking on Longji Terraced Field or cycling in Yangshuo make me exhausted? Hiking on Longji may make you a little tired. You can decide whether to hike upon arrival. If it is not doable to you, you can choose to take a simple palanquin. 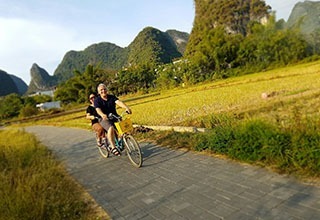 The distance and time for cycling in Yangshuo is flexible. Our tour guide will find the best itinerary for you. Is Guilin friendly to children? Yes, your children will like the countryside views and animals.